"Karnot Mahal is one of the most elegant heritage hotels in Jaipur. Its close location to almost every Jaipur sightseeing place has made it a personal favorite of tourists. The hotel is a retreat of care, calm, luxury and comfort. Everything in and around Karnot Mahal is a reminder of the glorious days of legendary Rajput Princes. The brilliant Karnot Mahal was built in the year 1742 A.D. by Thakur Samundar Karan ji of Thikana Sheora and Natwara clan who came down all the way from Jodhpur to Tonk district to be honored by late Maharaja Swai Jai Singh Ji of Jaipur. He was given the responsibility to protect the fort and the state from the Guerilla attacks of Marathas and become the head of Jaipur State Force. He and his descendants did their job perfectly and were always included in the Royal Council. Currently, existing as a heritage hotel, his descendants still remain the owners of a part of this building. Deluxe Rooms: These rooms offer amazing views of Jaipur’s historical monuments and Aravali Mountains. 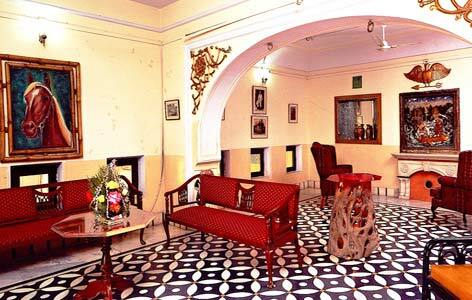 Standard Rooms: These rooms are very sophisticated and are adorned with authentic antiques of Jaipur. Royal Deluxe Room:These rooms are the most spacious and most elegant of the lot, especially designed for honeymoon travelers. Princess Court: The multi-cuisine restaurant serves India, Continental and Chinese dishes. The restaurant is known for its magnificent architecture. Floating Terrace:This multi-cuisine restaurant that serves amazing Indian and international cuisines. The best views of the city are offered from this restaurant. Situated at Eastern Rajasthan, the Pink city of Jaipur is known all over because of the heritage fortresses, Majestic palaces and remarkable pink sandstone architecture of buildings. Situated at a very close distance from Thar Desert, Jaipur has been a famous tourist destination for local and international travelers. It is the city of India where people love shopping for fabric and jewellery since Jaipur lies right in the middle of the rich mineral belt.